Visitors of live events in Sheffield will probably attend shows at Sheffield Arena. If you have any problems with booking tickets, you will need to contact Sheffield Arena. This page contains all of the contact details. Sheffield Arena first opened in 1991 in the city centre of Sheffield. It is the home of the Sheffield Steelers ice hockey club and has a capacity of 13,600. 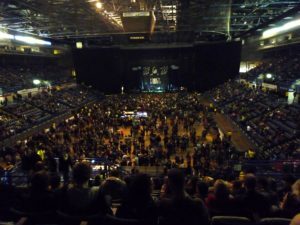 Sheffield Arena was previously the only venue of its size in the Yorkshire region until First Direct Arena opened in Leeds. The arena has changed names several times to reflect its sponsors. Over the years it has been the Hallam FM Arena and the Motorpoint Arena. For the moment it is the FlyDSA Arena, since Doncaster Sheffield Airport is sponsoring the venue from 2017-2020. Between sponsorships, it reverts to Sheffield Arena. It hosts 120+ events with 650,000 visitors every year. Contact Sheffield Arena about bookings for FlyDSA Arena events by phone. Whenever you have a question about events or the venue, contact Sheffield Arena customer services on 0844 248 2331. They can answer your queries about ticket sales, safety policies, and facilities. Before a trip to the arena, find out about the car parking situation and options for food. There are 8 food and drink outlets around the arena, but not all of them will be open for every event. Get advice on how to pre-book parking, or how to get to the arena on public transport. You can check which items you are not allowed to bring with you to make sure venue security does not refuse entry, or check the rules for queueing onsite. Book tickets for events at Sheffield Arena by calling 0844 248 2334 to connect to the box office. You will need to provide debit or credit card details over the phone for payment. When you book this way, there will be an additional 12% booking fee. The minimum charge will be 50p per ticket. This does not include costs for ticket delivery. You can choose to collect your tickets from the box office if you prefer. When an event goes on sale which is in high demand, the phone lines will be busy. You might have to hold in a queue for a while before getting through to the box office. Waiting on the phone does not guarantee ticket availability. Group bookings are available for a selection of events at the FlyDSA Arena. Some events offer discounts on group bookings. You could save money by attending a show with a large group, whether they’re family, friends, or colleagues. Group bookings may also be available for school trips. These bookings are normally only applicable for family-friendly tours, such as Walking With Dinosaurs and Cirque du Soleil. Call 0844 248 2335 to enquire about group bookings. The minimum number of people for a group booking is 10; for certain events, this number may be higher. You can also send an e-mail to groupsales@flydsaarena.co.uk. The purpose-built arena has accessible facilities so that customers with disabilities can attend events. If you need special requirements for a booking, call 0844 248 2336. Accessible tickets are limited and only available by calling the helpline. This is because the venue needs to reserve them to stop customers who don’t require specific seating from buying these tickets. You can purchase accessible tickets in person at the box office too. However, they are sold on a first-come, first-served basis. Book as soon as possible to avoid disappointment. You might be able to claim a free ticket for a personal assistant if you require one. Some events at the arena have bonus packages for VIP or hospitality experiences. Corporate bookings are also available for the 12-person luxury hospitality suites. These have a private toilet, bar, TV, and menu for in-suite catering. This could be hot food or finger food depending on the guests. The Arena Club offers the suites for annual or single use. Arena Club experiences include a prime location ticket, pre-show food and drink, and early entry. There are plenty of perks with Heart VIP Members Lounge annual memberships. To make a hospitality booking call 0844 248 2337, or e-mail any enquiries to hospitality@flydsaarena.co.uk. If you live in the Sheffield area and know someone who loves gigs, why not treat them to a Sheffield Arena gift voucher? They are available to buy online with amounts ranging from £10 to £100. Recipients can use their vouchers to buy tickets online, in person, or by phone for events at the FlyDSA Arena. Gift vouchers are valid for 18 months from the date of purchase. If you would like to purchase vouchers over the phone then call 0844 248 2338. You can call this number if you have any questions about a voucher purchase or redeeming gift vouchers. Cancellation for a refund is only available within 14 days of buying the vouchers. When the phone lines are busy, you can contact Sheffield Arena online instead. Direct any quick questions to social media, as customer services will respond on Facebook and Twitter. For enquiries about tickets or bookings, you can e-mail boxoffice@flydsaarena.co.uk. Send any questions or comments about customer service or the website to customerservices@flydsaarena.co.uk. Responses from this e-mail address could take up to 10 days. E-mail joe.waldron@flydsaarena.co.uk with enquiries about hiring the venue to host an event. E-mail kerrie.shakeshaft@siv.org.uk to discuss marketing opportunities for advertising at the arena.